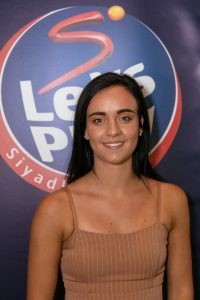 The prestigious SuperSport Let’s Play Sport Star of the Year Awards for the Bloemfontein newspaper, Bloemnews and Express Mangaung, was held on Friday 16 November at the Windmill Casino Conference Centre. First and second places were awarded for our newspaper partners. Our guest speakers for the day were well-known Cheetahs player – Dries Swanepoel and Elzana Kempen representing Spec-Savers & Execuspecs. Spec-Savers and Execuspecs came on board by sponsoring 2 x R2000 Police Sunglasses coupon for the winners as well as a 2 x R500 gift coupon for the 2nd place winner as well as a R1000 x lucky draw voucher for the parents. 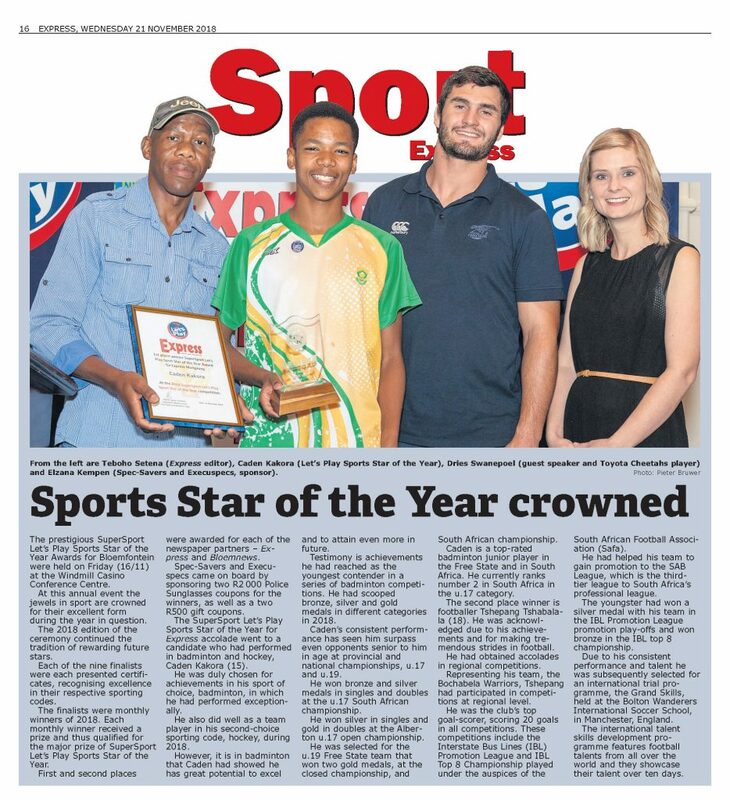 Caden Kakora (15) is duly chosen as SuperSport Let’s Play Express Sport of the Year for excelling and achievements in his sport code of choice, Badminton. He did exceptionally as a team player in his second-choice sporting code, Hockey during 2018. Caden has great potential to excel and to attain even more in future in Badminton. Testimony is achievements he scored as the youngest contender in a series of Badminton competitions in which he scooped medals, bronze, silver and gold in the different categories during 2018. Caden’s consistent performance has seen him surpass even opponents’ senior to him in age at provincial and national championships, u.17 and u.19. 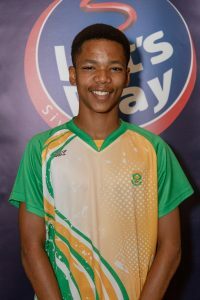 He won bronze and silver medals in singles and doubles at the u.17 SA championship. He won silver in singles and gold in doubles at Alberton u.17 Open championship. He was selected for the u.19 Free State team that won two gold medals, at the Closed Championship, and SA championship. Caden is a top-rated Badminton junior player in the Free State and in SA. Currently he ranks number 2 in SA in the u.17 category. Congratulations to Caden! Tshepang Tshabalala was (18) was chosen as the Best-Runner-up due to his achievements and for tremendous strides in football. He obtained accolades in regional competitions. Representing his team Bochabela Warriors, Tshepang participated in few competitions at regional level. He became the club’s top goal-scorer, 20 goals in all competitions. Competition includes the Interstate Bus Line Promotion League and IBL Top 8 Championship played under the auspices of the South African Football Association (SAFA). He helped his team to gain promotion to the SAB League, which is the third-tier league to South Africa’s professional league, Premier Soccer League. Tshepang won silver medal with his team in the IBL Promotion League promotion play-offs and won bronze in the IBL Top 8 championship. Due to his consistent performance and talent, Tshepang was subsequently selected for the international trial programme, the Grand Skills held at the Bolton Wanderers International Soccer School, in Manchester, England. There, he competed against football talents from all over the world over 10-days. 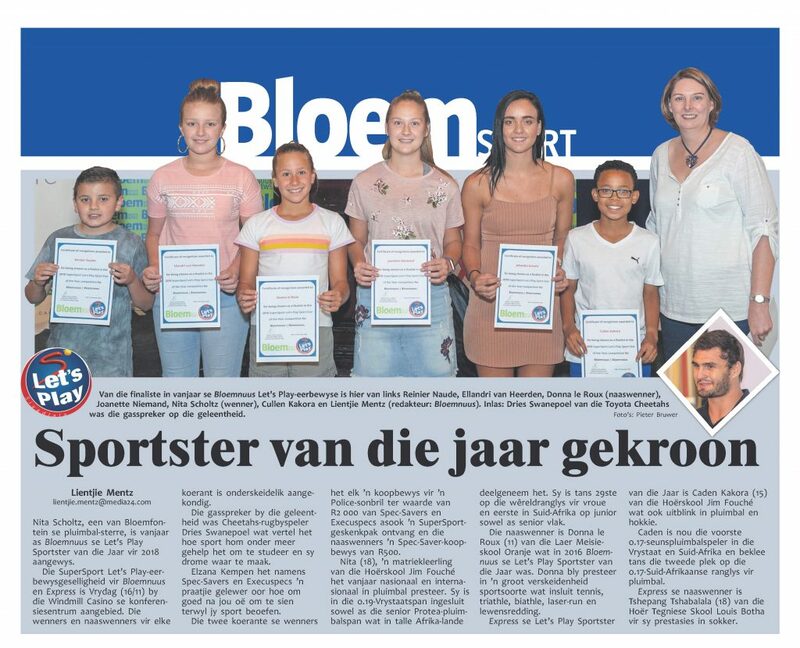 This year’s Bloemnews Let’s Play Sport Star of the Year is Johanita (Nita) Scholtz. Nita did very well this year in badminton, nationally as well as internationally. Not only did she do well on school level, she was also included as Grade 12 pupil of Jim Fouché High School in the U19 Free State team and the senior Protea badminton team who will participate in several African countries. 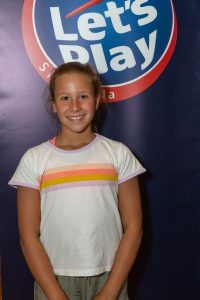 She currently ranks 29th on the world rankings and number one in South Africa at junior and senior level. 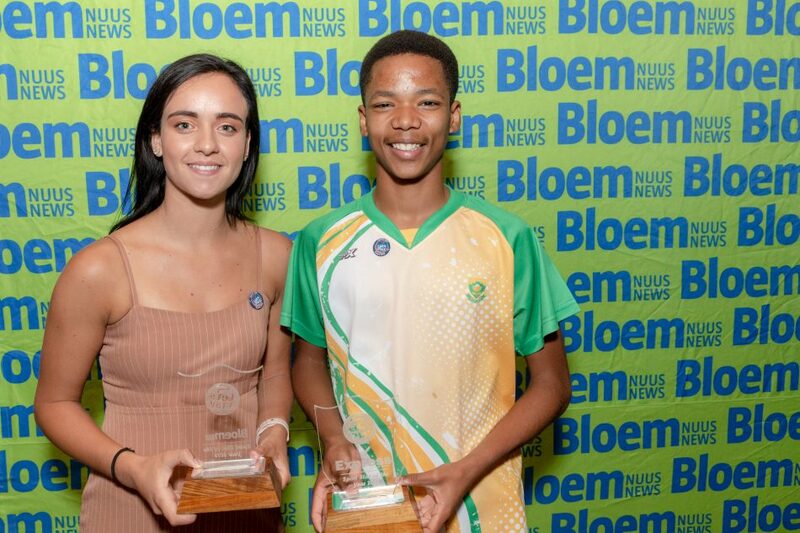 As part of the Free State’s top badminton team, Nita follows the footsteps of Marnus van der Walt who was the Bloemnews Let’s Play Sport Star of 2017 with his achievements in badminton. This year, second place is awarded to Donna le Roux. She has a wide variety of sporting codes in which she participates. Donna is a learner at the Primary Girls School Oranje. She has a variety of achievements: In tennis as part of the u/12 team, bathle 1st place in the Free State Championships and 4th nationally, triathle 1st place in the Free State Championships and 5th nationally, Laser-run where she achieved a third place in the SA Championships. and Lifesaving where she obtained a gold medal for the Free State Championships and improved three Free State records.